The Chicago Tribune Archives: Their newspaper archives go all the way back to 1849. Naturally, this includes the 1920s as well. So, say, if you’re researching the Sacco and Vanzetti trial, you can follow it in the papers from 1919 up to their execution in 1927. Unsurprisingly, it’s a great place for primary sources. NOTE: This site requires access codes from a partner institution. The Chicago History Museum: Not only is their museum awesome, but they’ve got a lovely research facility with all sorts of primary documents. You can view more about it here–just don’t forget to make an appointment! They also have a bunch of virtual resources as well. The Encyclopedia of Chicago: A great place to start for any Chicago history topic, really, since they often cite their sources, which of course leads to other sources, and other sources, and so on… Plus they’ve got some awesome maps, too. Illinois State Highway Maps: Need a Chicago road-map from 1927? I did once, and I found it here. There are quite a lot of other maps, too, but a couple from the 1920s. 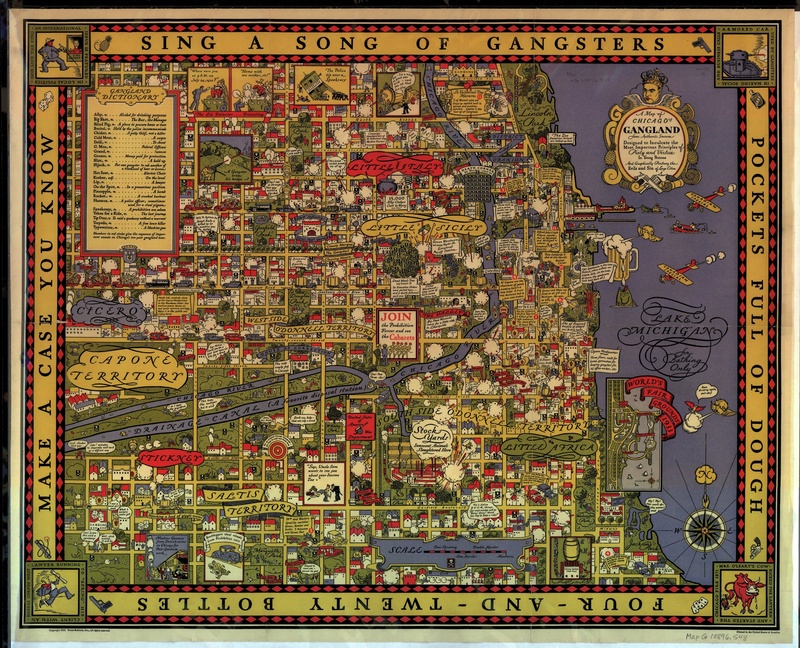 Sociology Maps from the University of Chicago: During the 1920s and 1930s, sociologists at the University of Chicago documented tons of different aspects of Chicago life, from where ethnic groups were located around the city to where the industrial and residential areas were. They made a ton of wonderfully detailed maps to go with their reams of data, many of which can be found here. This is one of my favorite sites ever. The books that go with this maps, many of which can be ordered via inter-library loan at your local library, are also treasure-troves of information. Census maps grouped by ethnicity can be found here, government and industrial maps are here, and a more random collection of maps—including some crime ones—can be found here. 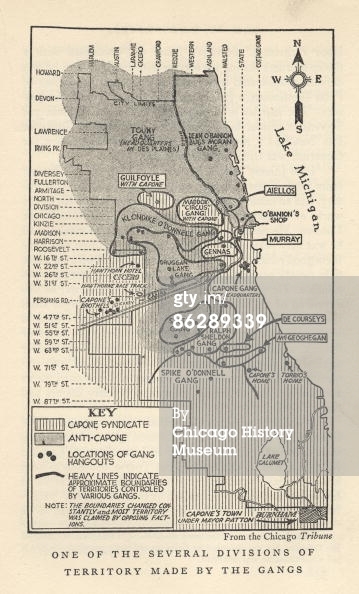 However, please note: if you’re looking for information on Chicago’s underworld, Thrasher’s “Chicago’s gangland” map actually comes from a book called The Gang: A Study of 1,313 Gangs in Chicago, which, while fascinating, is a study of juvenile gangs–i.e., children under the age of 14. Sorry for the lack of resolution—this map is easy to find in most books on Capone, however. If anyone can tell me where this damn thing came from, I’d love to know. I think I narrowed it down to a Tribune reporter once, but I’ve never been able to clearly attribute it to any one source in particular. Circa 1931, or thereabouts. I want a poster of this!!!! The 1920s Fashion and Music Blog: Jesse Boland’s blog is a great introduction to the music and fashion of the 1920s. If you need a quick place to grab some information and pictures on flappers, for example, it’s worth checking out. My Al Capone Museum: Don’t let the giant fonts and crazed underlining fool you. Mario Gomes is one dedicated guy: the vast website he’s built in honor of Al Capone and his world is extensive, amazing, and a little bit nuts. Yet, if you’re willing to sift through it all, there is a wealth of good information scattered around his 361+ pages of content. It’s also a terrific place for photographs of Al and his cronies, as well as good basic information about the crowd he ran with. Gomes’ personal collection of gangster memorabilia is very unique as well. He’s the only person in the country to own the last brick from the St. Valentine’s Day Massacre wall–the rest are all in the Mob Museum in Las Vegas. Poking around his site can be well worth it, if you’re patient. Prosperity and Thrift: Explore the Coolidge era of economic prosperity courtesy of the Library of Congress. There are tons of documents here, including old advertisements. Biography of America: The Twenties 1913-1929 This educational site hosts an entire video series about the Roaring Twenties, with a bunch of links and other things. The Lawless Decade website: A companion to the 1957 book, full of photos and information about the 1920s. America on the Move: Ever wanted to know what’s in a Model T repair toolkit? Check out this Smithsonian website companion to their exhibit America on the Move, about the birth, growth, and lasting nationwide changes brought about by Henry Ford’s Model T.
Making Sense of [Historical] Evidence: While this site is technically for educators and students, anyone who needs help understanding a primary source will find this website useful. Immigration to the United States: An exploration of the immigrant experience from 1789-1930, courtesy of Harvard. Lots of great photos! Prohibition: The companion website to Ken Burn’s PBS documentary, including all three episodes! And yes, if you’re wondering, you CAN cite television programs ;). Best of History: Roaring Twenties A plethora of educational websites. Lots of good bits in here if you don’t mind digging. Roaring Twenties History Blog: This blog appears to be defunct (no new updates in 5 years) but there seems to be decent, if sparse, info here. Good for an introduction or two, I suppose. Back Issues of The Chicagoan, 1926-1935: The city’s version of the New Yorker, this period magazine focused on the cultural achievements of the city. Looking for gorgeous vintage ads, editorial pieces on newfangled modern artists, theatre reviews, or what have you? Then have fun poking through back issues courtesy of the University of Chicago library, which allows you to view them all for free online! History Study Center: Does your local library or university have access to this database? If so, it’s also got tons of great primary resources from the 1920s. NOTE: This site requires access codes from a partner institution. And the best part? You don’t need a Chicago library card to access them! 🙂 It’s all powered by the Library of Congress. The Chicago Examiner, 1908-1918: Hearst’s Chicago paper ran from 1902 to 1974 under various names. The Chicago Public Library has access to a ten year run whose highlights include the Eastland Disaster and the Union Stockyards fire. These are full page scans of newspaper articles. 1920-30.com: A good, basic website full of lots of general information about life in the 1920s with a wide range of topics. A good companion to something like David Kyvig’s excellent book, Daily Life in the United States, 1920-1940. Archives for the Chicago Defender: Arguably one of the most important early African American newspapers ever made, the Chicago Defender is an ongoing newspaper that has addressed African American issues since 1905. In Chicago during the 1920s, the Defender was instrumental in boosting the Great Migration of African Americans from the South to the North, as well as promoting cultural events like the Bud Billiken Parade and Picnic and establishing the Bud Billiken Club. Articles from 1905 through 1975 can be accessed via the Defender‘s website here. Searching is free, but articles must be purchased. If you’re a Chicago Public Library cardholder, however, you can access them for free here. LoveVintageRecipes.com: This cute little WordPress blog posts basic vintage recipes, many of them from the early 1900s, particularly around WWI, and the 1920s as well. If you want an idea of what people ate back then—or want to try some vintage recipes—this is a good place to start. A Biography of America: The Twenties: Provided by the Annenberg Learner Company as a companion website to one of their educational documentaries, this site covers a broad range of 1920s life and times, but also includes an interactive map of Los Angeles circa 1925, which is useful if you’re doing research or writing about that location. Westerville Public Library’s Anti-Saloon League Collection and Museum: This public library in Westerville, OH, features something besides books—a small museum dedicated to the Anti-Saloon League, a major part of the Temperance movement which saw the passage of the Volstead Act! Check out their website for excellent information regarding this important organization, including a ton of awesome propaganda from that era. Teaching The American 20s: Created by the University of Texas’s Harry Ransom Center, this website is a companion piece for K-12 educators for an exhibit about the 1920s from 2007. While the exhibit is long gone, the website remains—and it offers a very nice overview of the time period, as well as lot of excellent photos and period art. Looking for Books Written DURING the 1920s? Internet Archive: Want millions of free eBooks and scans of full-text primary sources from all over the web? Then try this FREE resource aggregator, which also hosts photos, films, websites, audio files, and tons more. The best part about it is you can search thousands of different online book collections, many of which belong to universities, museums, or special collections, all at once. Highlights include collections from Cornell University, the Library of Congress, and something called “American libraries,” which include thousands of searchable public and private library collections within it. Project Gutenberg: Pretty much everyone knows about this site, but I thought I’d include it here for the sake of completeness. Same with Google Books. Want EVEN MORE RESOURCES? Try Some of my Book Lists! Looking for some actual, physical, real-life books relating to these topics? Check out my post on the best Prohibition books for kids and teens, or try my new page, the Roaring Twenties and Prohibition Book List.